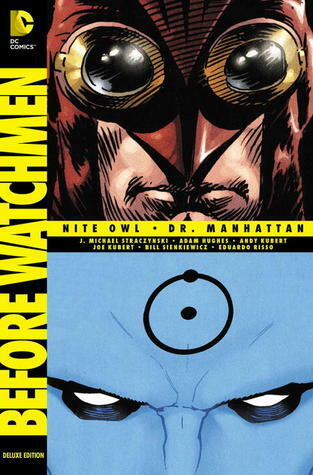 This is the last of the four Before Watchmen graphic novels that I have for review. It has been an interesting time, revisiting these characters that I read back in the 1980’s. While it was fun to see these unique characters again, despite being rather unlikeable in many cases, I still have a recurring question … what was the point of this? This volume contains three short stories, one for Nite Owl, one for Dr. Manhattan, and a very brief one for Moloch. The Nite Owl story I found interesting…I liked seeing that the longevity of a superhero name came from one man passing on the name and costume and all the good and bad that goes with it, to the younger protégé. This is not such a new idea, I suppose, with costumed heroes doing that fairly regularly now, but it struck as a rather unusual idea for the era in which the story is set. Unfortunately, the younger Nite Owl doesn’t seem to be ready for his role. His social awkwardness plays against his being ready to take on the role of hero to the society. None of the Watchmen heroes are particularly likeable…we’ve seen that now, through the course of these four books, if not in the original series…which makes me wonder what the purpose is to tell these particular stories. These are interesting stories, as prequels go, but they are still stories about heroes who are not particularly heroic. Dr. Manhattan’s story is the better story in this book. My recollection of him from the Watchmen days was that he was the most ambuguous of the characters, but here, with much thanks to J. Michael Straczinski, he is a fully fleshed-out character (no pun intended, but pun accepted). Perhaps it’s my love of the absurd and how much I enjoy complicated logic, but this story is not particularly linear and deals with possibilities and alternatives and all sorts of fun sci-fi-ish things. This was fun. The artwork in both stories was fine, though I must admit that I still think back to the wonderful art and layouts from the Ozymandias book. Moloch’s story is much shorter then the two titular superheroes, but it gives us the backstory of this villain, leading up to the beginning of Watchmen. Like so many of the other stories, it’s not particularly fun or likeable, but it is interesting. At least it’s consistent in that sense. Looking for a good book? This graphic novel prequel will suit your needs if you enjoyed the original Watchmen series, otherwise you might just want to look for something a little newer.